“Panama contains several major copper and gold deposits. The two largest copper deposits are Cerro Colorado and Cobre Panama. Canada’s Inmet Mining Corporation, a publicly-traded company listed on the Toronto Stock Exchange, owns 100 per cent of the Cobre Panama concession, located in north-central Panama. 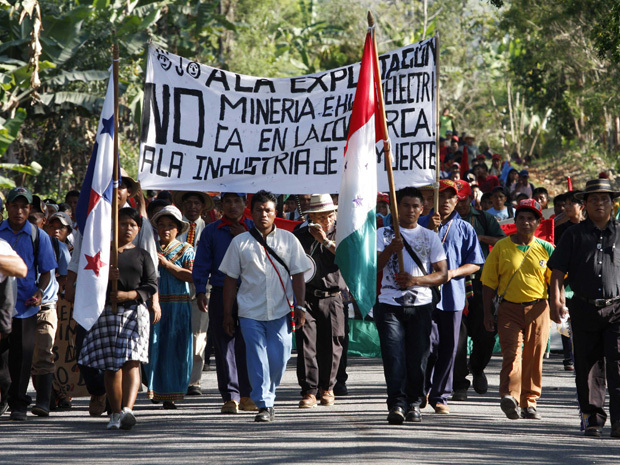 The proposed open-pit mine site neighbours several Indigenous Ngobe and campesino (peasant) communities. The Cobre Panama project is expected to begin operations in the near future, pending approval of its Environmental and Social Impact Assessment. “Since entering office in 2009, President Ricardo Martinelli has made clear his intent to attract international investors and push forward mining projects across the country. To facilitate this, the government passed a controversial law in February of this year. Law 8 revised the 1963 Mining Code to permit foreign state-owned companies to directly invest in mining concessions. This would allow such companies to control vast tracts of land in Panama, despite contravening Article 3 of the Constitution, which prohibits ceding national territory to other states. “Martinelli travelled to San Felix to announce that Law 8 would be renounced. This will effectively erase the contentious changes to the mining code. It is unclear to what degree this change was motivated by the Ngöbe protests or external pressure. Having been there and other places in the world the indigenous people do not want development it is actually people from outside of the community or country that are the trouble causers and this is certainly the case in Panama and particularly with the development of the Cerro Colorado Deposit. The indigenous people actually would like to see the mine developed, but they also want part of rewards for having it developed. They want the good jobs that it would provide, and they also want part of the royalties that would be paid to the Panama goverment. I found the Ngabe Bugle people that I talked very respetive of the mine development. I am in Panama now and is worried about what is happening. It is hard if you are not fluently in spanish to follow all the details. Are you following up what is happening now. I can not find anything in canadian papers. No I have not seen anything either in Cdn papers about the situation in Panama. Please let me know what is happening. Yes I speak Spanish so feel free to send local media links. There is also a section for english. The Pan American highway is now open and the buses are running. The canadian Ambasador to Panama has been briefed from a local activist.